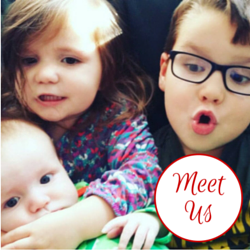 This time of year can be a challenge when you have a little one on the move, you want to keep their little toes warm when they are crawling or walking on a cold floor but you want their feet to be free to move and breathe too. If, for December, you can find a fun, Christmas pair of slippers then so much the better. That's where Daisy Roots come in, they offer a range of handmade, beautifully soft suede and leather baby slippers and have just launched their Christmas range. 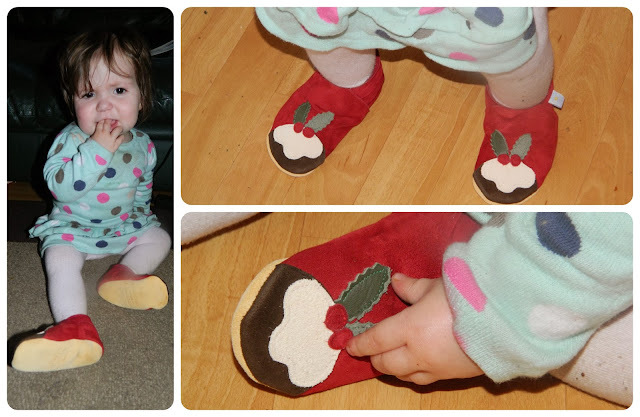 They asked if Little Miss would like to try out a pair to keep her toes warm and cozy this December and we were pleased to receive a pair of their Christmas Pudding shoes. The shoes arrive beautifully packaged in a clear plastic bag, great for storage, especially in a pair of Christmas shoes as you will probably need to put them away again ready to be worn again in future years, or passed on to another baby. 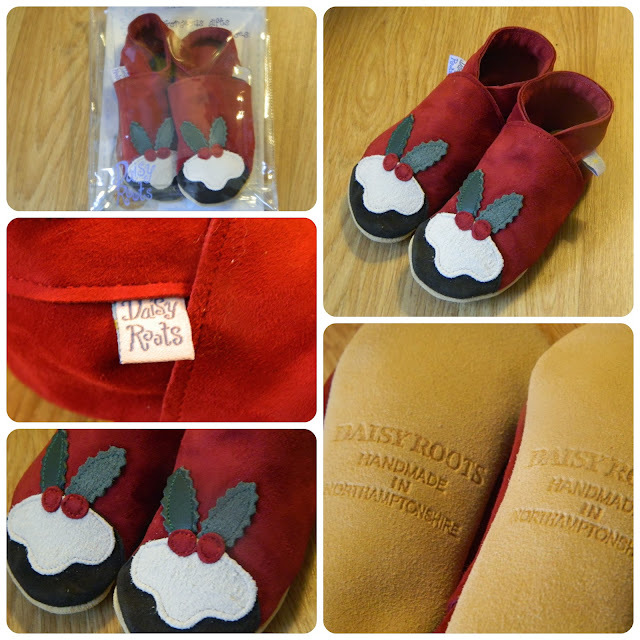 The Christmas Pudding shoes are made from suede, with a natural coloured sole - embosed with the Daisy Roots name and that they are handmade in Northamptonshire - and red suede uppers. Each toe is decorated with a cute stiched on suede Christmas pudding. The slippers have a little tag on the outside of each foot which helps you to ensure they are on the correct feet, a daisy on the left and 'Daisy Roots' on the right. The slippers are suitable for a boy or girl and would be great as the finishing touch to any festive outfit. I asked for size 12-18 months for Little Miss and they are large on her. She only has tiny feet but, at 15 months I thought 6-12 months might be too small still, I think she might actually be able to wear these next Christmas too though. Thankfully, as the ankles are gently elasticated, she can still wear them and walk in them. The suede is beautifully soft and it is so easy to gently pop them onto her feet. She isn't overly keen on shoes and has been able to remove them herself but she can do that with most things so I'm not surprised at all. I'm extremely impressed by the quality of the shoes, the softness, design and the suede used combine to make for a beautiful pair of baby slippers. Little Miss is just starting to walk around and has had no trouble doing so wearing the slippers, the suede sole is non-slip so she is able to stand, and toddle, securely in them. At £18:50 they are an expensive pair of shoes for a baby but, as a beautiful festive gift, for a Christmas outfit and for slippers that could be worn through the festive period and beyond, I would definitely recommend them. They are available from small (0-6 months) up to 'Bigger' (age 3-4, priced at £2 extra) so you could even get matching pairs for your little ones. There are ten different pairs in the Christmas range and Daisy Roots also have gift sets, which include a pair of shoes and a t-shirt, and a Christmas Tabbeez comforter too. Disclaimer: We received a pair of slippers for the purpose of this review, all opinions are honest.